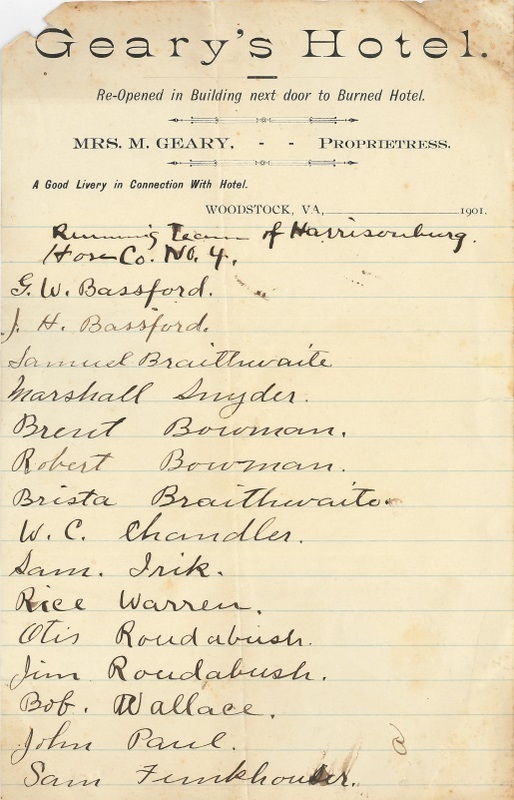 Document bearing Geary Hotel letter head listing the running team of Harrisonburg Hose Company Number 4. The running team would have been part of a series of hose reel races that occurred in Woodstock on July 4, 1904 when the town celebrated the instillation of its new water system. The Harrisonburg Team placed first in the race. 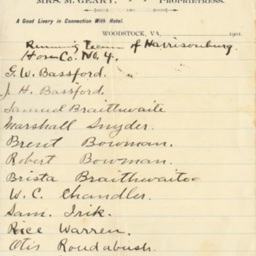 Folder 1.43: Running Team of Harrisonburg Hose Company Number 4, ca. 1901, Bonnie Painter Collection, Truban Archives, Shenandoah County Library, Edinburg, Virginia. Unknown, “Running Team of Harrisonburg Hose Co. No. 4,” Shenandoah County Library Archives, accessed April 22, 2019, http://archives.countylib.org/items/show/11708.